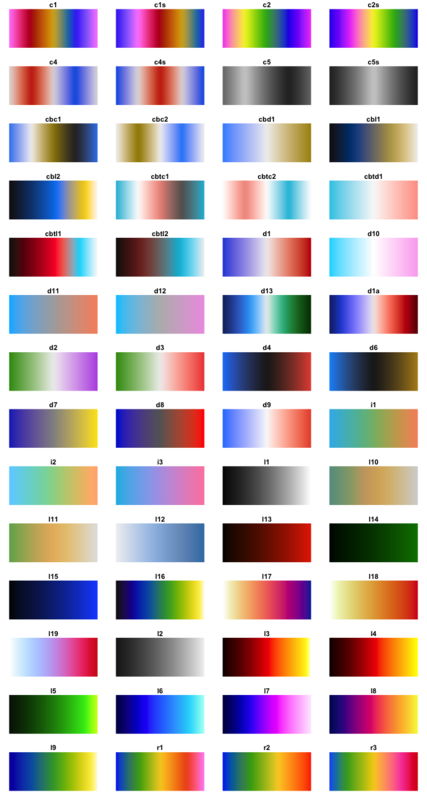 Collection of perceptually uniform colour maps made by Peter Kovesi (2015) "Good Colour Maps: How to Design Them" at the Centre for Exploration Targeting (CET). The cetcolor package is designed to bring to R the 56 colour maps created by Peter Kovesi that avoid points of locally high colour contrast leading to the perception of false anomalies in your data when there is none. The colour maps have been designed to avoid this phenomenon by having uniform perceptual contrast over their whole range. The cetcolor package is available on both CRAN and GitHub. The CRAN version is considered stable while the GitHub version is in a state of development and may break. #>  "#F1F1F1" "#C0D3EB" "#93B5DD" "#7197C1" "#3B7CB2"
Location of CSV data, references, and data. Referenced documentation and possible reimplementation of generation functions to avoid using CSV data. Provides MATLAB perceptually uniform colour maps in a manner that is similar to this package. Function interface naming, e.g. cet_pal(n, name), and colour map displays. Proper ways to interface colour palettes with ggplot2 as shown for RColorBrewer. Allow for n > 256. Port over the Peter’s generation code from Julia / MATLAB to R.
Added new naming scheme to access elements. Renamed old palettes to use the new shortnaming scheme. Please switch from using the long palette names to the short names. Documentation switched from using Rd format to using Markdown in Roxygen2. Several of the initial color palettes have been deprecated. These palettes will be phased out within the year. Please find a new palette. Nicknamed frequently used colour maps. 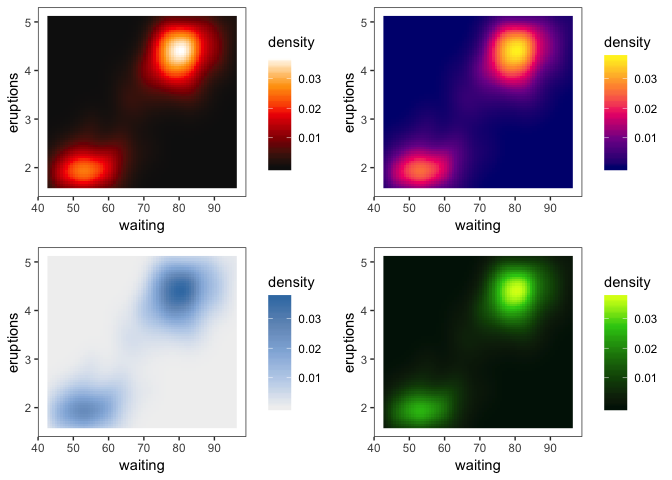 Vignette displaying the colour maps within R.